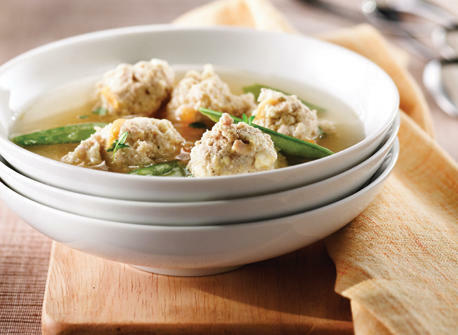 When you’re after a light, yet satisfying meal make this yummy chicken & cheese dumpling and fresh veggie soup. Serve with buttered crusty whole-grain bread. 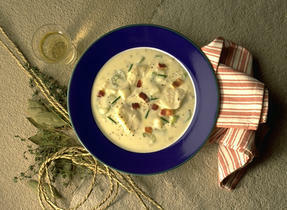 In a medium bowl, using a spoon thoroughly combine chicken, Canadian Ricotta and Parmesan cheeses, egg and garlic. Refrigerate. 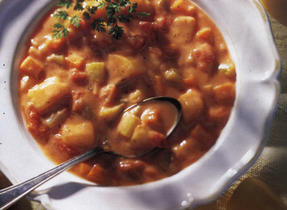 In large saucepan, combine broth, water, carrots and thyme; cover and bring to a simmer over high heat. Using two large spoons drop chicken and cheese dumplings into broth (you should have 12 dumplings). Reduce heat and simmer uncovered gently for 5 min. Stir in snow peas and simmer for 5 min longer or until dumplings are firm and no longer pink inside and vegetables are tender-crisp. Stir in white wine vinegar and season to taste with salt and pepper. Cooking Tip: Use regular, smooth or light Canadian Ricotta cheese. To keep the dumplings from breaking apart maintain the broth at a gentle simmer, adjusting the heat as necessary while the dumplings cook. Variation: Use 3 fresh thyme sprigs and omit the dried thyme. Remove sprigs before serving.